1. Bear attacks – North America – Prevention. 2. Outdoor recreation – North America – Safety measures. Preface: Who’s Who, Who Cares, and Why? 1. Where can I find each species? 2. Which species of bear is that? I thought I knew how to tell. 3. A rainbow of fur colors within each species. 4. Is that a male or a female? How old? 5. Ursine romance and bear-enthood. 6. I know that bear! Or do I? wind eddies. Flakes glistened platinum in the morning light until the sun was hidden by clouds. beyond across the Great Plains. quickly built drafts. Within an hour or two, they could block trails with so much powder snow that no one could cross on foot. I’d sink out of sight. species. Prints were plentiful, but most were too drifted over to reveal what I needed to know. t. And these were definitely short. A blackie, thank God! – big enough to walk faster than I jogged. Unless it stopped for something, I’d probably luck out and never catch up. creek where it was drinking. I don’t know what possessed me in that moment. Normally, I took great pains to avoid revealing myself to bears. But not now. (Kermode) Bear, the first that I’d ever seen or even heard of away from Princess Royal Island on the coast of British Columbia. expecting the bear to look up at me, then bound away. and humped shoulders guaranteed that. I knew it had to be the same animal I’d been following. Tracks had led me right to it. But the finger claws in its tracks had looked blackie-short! How could I have been mistaken? been digging out marmots or ground squirrels that had fattened up for hibernation. I’d been wrong on a lot of things about bears. And this might be my last mistake. before veering aside and resuming its walk down the trail. existence, offering no harm to people and hopefully receiving none in return. the privilege of not only meeting one, but capturing its image on film. Or had I? Only after this Ghost had disappeared into the blowing snow did I realize that I’d never snapped the shutter. bay, plunging past 7400 ft. Mt. 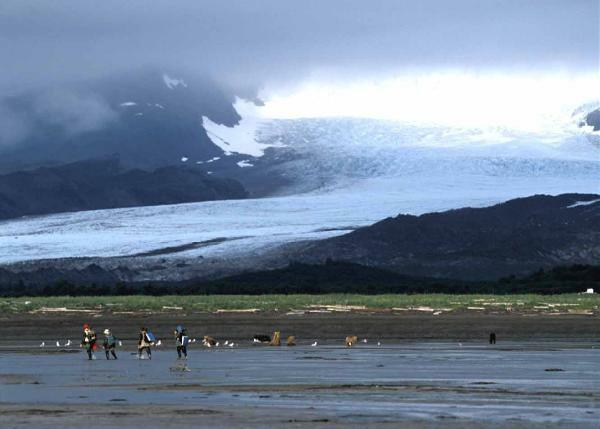 Stellar down more than a vertical mile of snow and ice that crusted Hallo Glacier. The previous night’s moon had been full, raising the tide so high that it covered this beach with more than 20 feet of water. bonanza of sweet, succulent razor clams. deep water from skiff to sand flat. clam. 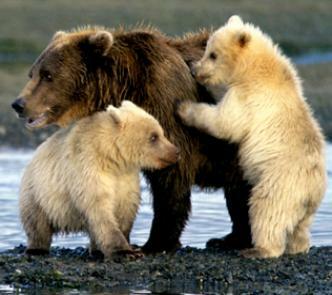 When one was scented, a bear would dig down and use its claws to rake up the mollusk. Ghost grizzlies. Alma with her twin 1st-year cubs, Snowball (in front of her) and Alba, behind her. (Kent Fredriksson photos). on the book’s front cover) to yellowish or grayish white (above photo), with Alba being slightly greyer than her brother. discouraged her lonely son from wandering away. that create a Ghost Grizzly. mates, or to bring their mother into heat a year or so before she would have otherwise. 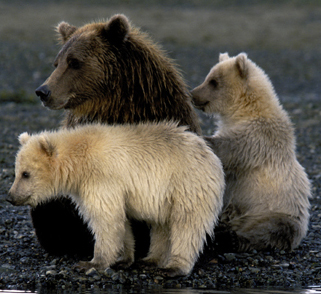 from rival males – perhaps by excluding rivals from the range occupied by his own cubs and their mother(s). or appeased at the first hint of conflict? ursine life dramas as other people are by TV soap operas or action movies. summer, a bear as distinctive as Snowball was simple to keep track of for the next few years. in a language you can’t understand, where some of the characters look so much alike that you can’t tell one from another. for the sea-water to reach her brood, the blond mother arose and stretched. Then, to my surprise, she didn’t head for shore. off my can of bear pepper spray. was protecting her first cubs the same way. distinct personalities, strengths and weaknesses. Indigenous peoples and Zen Buddhists sometimes refer to as “becoming” -- becoming Bear. reproductive status, and identity could markedly improve your safety and viewing enjoyment. other bruin for a trophy boar. 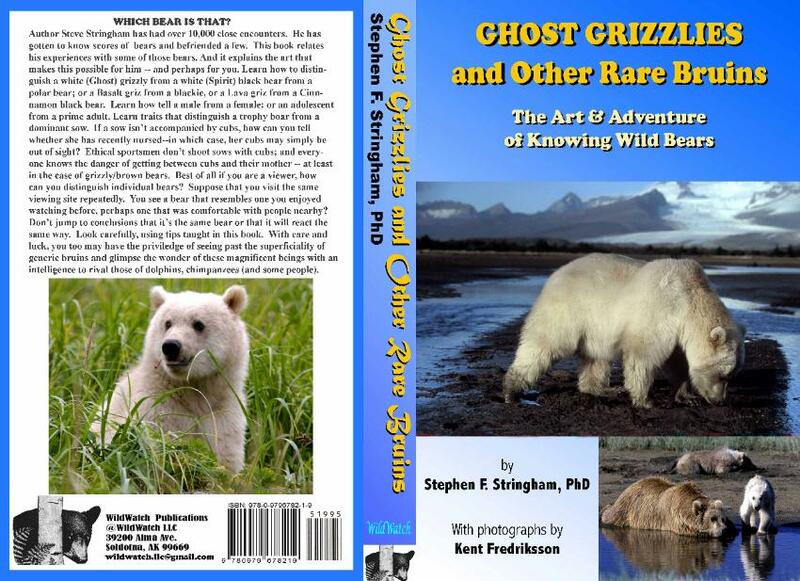 Chapter 1 identifies the world’s eight surviving bear species as well as a few extinct species, along with where they have lived. equally helpful to people who prefer avoiding bears or to those who seek bears to watch or hunt. (Kermode) Bear, Glacier Bear, Ghost Grizzly, and many others. they are unknown even to some bear experts. to draw suitors like flies to honey) or raising cubs, or whether a boar has lovin’ or eatin’ on his mind. it much easier to recognize individuals.